Impress everyone from the second you open your hood with UPR Products Chrome Plated Hood Prop Rod for your 1994-2004 Ford Mustang. The prop rod is one of the first things people see when opening your hood so why not make it jump out at them with our Brilliant Chrome Finish! 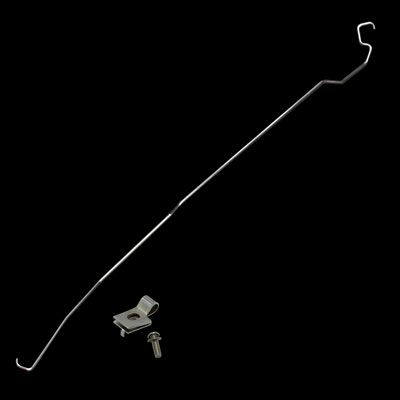 The factory prop rod is stripped and chromed for an amazing finish under the hood of your car. Includes chromed mounting bracket and stainless hardware. Installs in 5 minutes or less with included hardware. 1994 1995 1996 1997 1998 1999 2000 2001 2002 2003 2004 GT Cobra Bullitt Mach 1 V8 Mustang Roush & Saleen Vehicles. No one else can stack up to the bold clean styling of our aftermarket Billet dress ups, Street Strip & Racing Suspension & Performance Parts for your late model American Muscle Car!